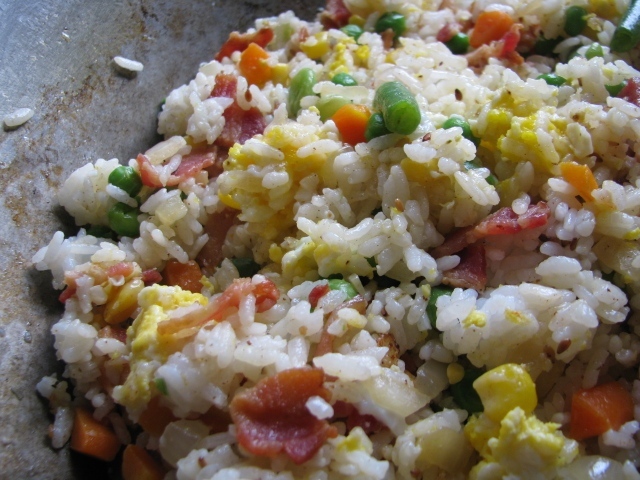 This is fried rice the quick and cheating way - using a package of frozen mixed vegetables. Yes - I know - shame on me! But I had quite a few other dishes to prepare for this birthday dinner so I needed to make the short cuts where I could. And honestly - I remember my mother doing this many, many times so it couldn't be that bad...right? If you have time to dice 16 ounces of various vegetables then please do so. Or, if you have a bunch of leftovers - chop those up and use them in your dish. For my mother - if she wasn't using a package of bacon she used leftover pork or a little chopped up steak or chicken and it was always delicious. Just be sure to keep an eye on things. This dish cooks pretty quickly and if you're like me you don't want all the vegetables getting mushy gross. note: This recipe needed to be a side dish for 15 to 20 people so it might seem like quite a bit. Scale it down for however many you are serving. And whatever else you might want to toss in here. Cook until almost crispy then remove to a plate with a paper towel on it. You will need to remove most of the bacon grease, but leave a little bit in the pan as well as all the brown bits on the bottom - you want those! Now saute the onion and garlic for a couple minutes in the leftover bacon grease. Cook on medium high until the frozen vegetables are heated through. For me this means I keep eating the little pieces of green beans to check for doneness. Once those are hot my mix is done and ready for rice. Toss the bacon back in and give everything a good stir. 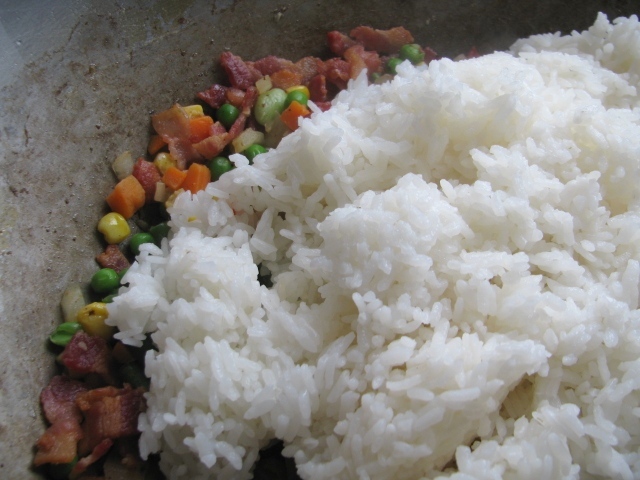 Squish all the rice mixture to one side of the pan and kind of scootch that part of the pan off the heat. Drizzle a little sesame oil onto the bare part of the pan and add the eggs here - make sure this is the part that is directly over the heat. I really do have four eggs in here - not sure where the other one is in this photo. 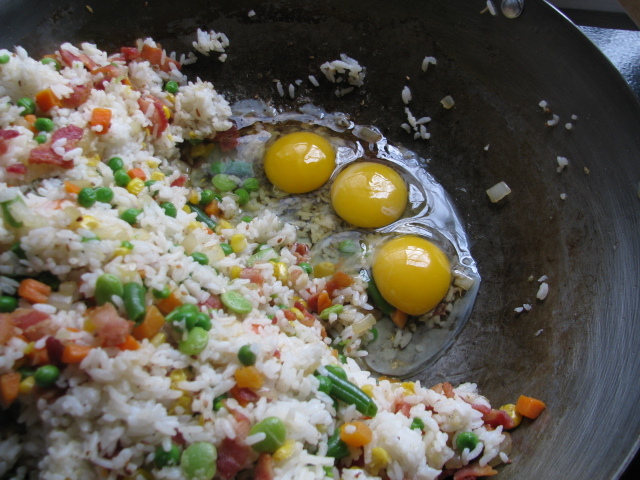 Let the eggs cook for four or five minutes then push the rice mixture over the top of them. Cook another minute then carefully start mixing it all in. Here I usually use a spatula so I can scrape all the tasty bits off the bottom as well as get a good mix going. Once the eggs are cooked add the chopped scallions and a handful of toasted sesame seeds. 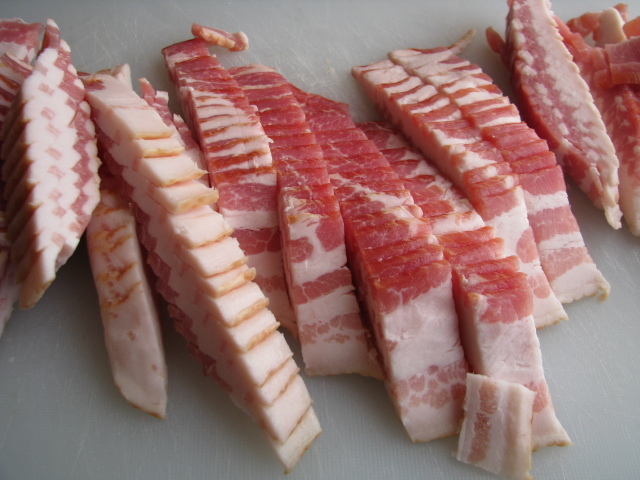 Taste for seasoning - you might add a teaspoon or two of salt but I usually find the bacon does the salting trick for me.